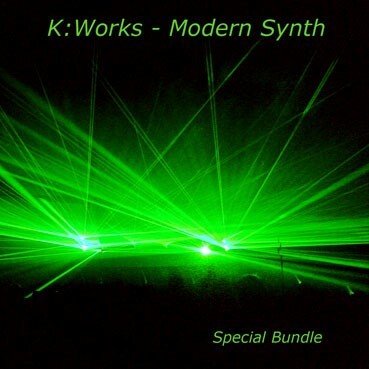 The K:Works - Modern Synth - Special Bundle includes our K:Works - Modern Synth Volume 1 - Volume 5 sound program collections for an exclusive discounted price (Worth 219,75 € / Save 40,75 €). Complete Modern Synth collection of sound programs never before released for Kurzweil K2xxx synthesizers. This is an essential sound selection for a wide variety of music styles (Techno, Trance, House, Jungle, Rave, Break Beat, Drum´n´Bass, Euro Dance, Hip-Hop, Trip-Hop, Ambient, EBM, Industrial, etc.). In addition to this, all Kurzweil K2xxx ROM and FARM "Modern Synth" sound programs, newly sorted and well organized by Art of Sound to achieve easier access and use, have been added free of charge as a bonus. Info: All original K:Works sound programs use internal Kurzweil K2661 ROM samples exclusively, there are no external samples used. Note: This soundware collection is designed for a basic version of the Kurzweil K2661 synthesizers. The K:Works soundware collections designed for Kurzweil K2661 are virtually identical to K:Works "EX" soundware collections designed for Kurzweil K2600/K2600R synthesizers with Contemporary and Orchestral optional ROM boards installed. However the K:Works sound banks designed for Kurzweil K2661 synthesizers contains different technical information.